Did you know that Cicadas base their life on prime numbers? They only hatch at intervals of 13 and 17 years…which are both prime numbers. It is an odd fact, but interesting to note that prime and composite numbers can be found in other areas besides a math classroom. 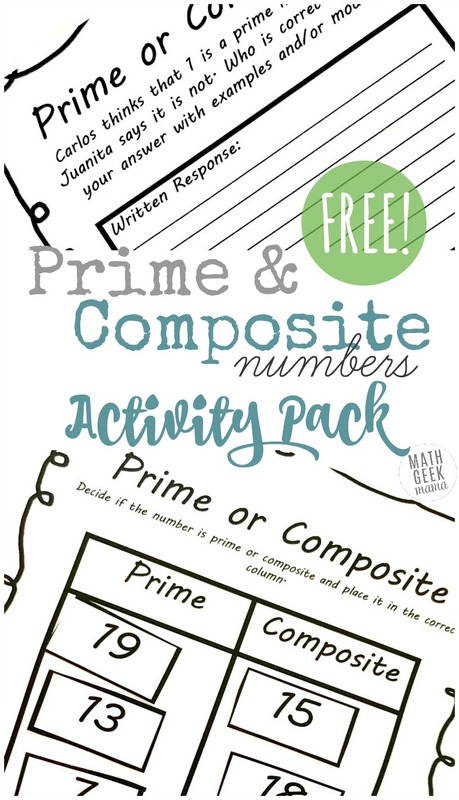 And today we are going to look at these interesting numbers with this set of prime and composite numbers worksheets! 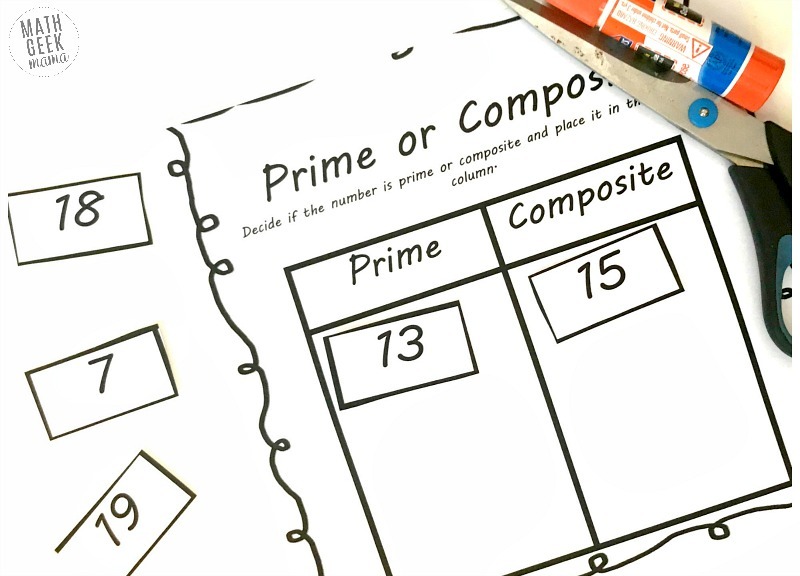 What are Prime and Composite Numbers? When teaching young children what prime and composite numbers are, we tend to focus on one aspect…the number of factors. 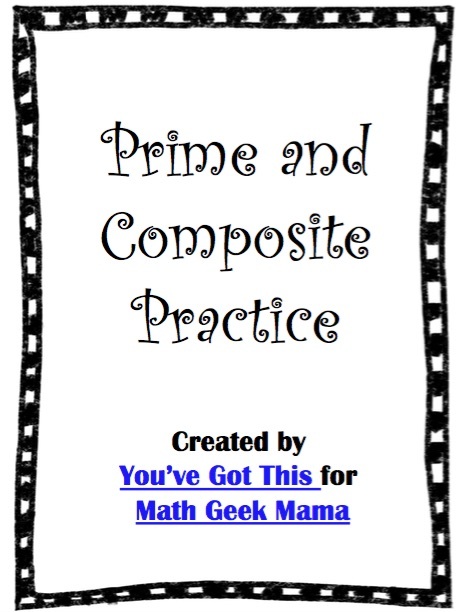 Though there is much more to prime and composite numbers than this, it is a great place to start. One way to teach a prime number is that it can only be evenly divided by 1 and itself. For example, 5 is a prime number. 1 x 5 = 5 and that’s it. A composite number is a number that has more factors, in addition to just one and itself. It is important to note that some numbers are a little odd. All even numbers are composite numbers…well except for one number. The number 2 is a prime number. Why? Because it can only be evenly divided by 1 and itself. Now let’s look at the number 1. We know the rule for being a prime number is being evenly divided by 1 and itself. Up until the 20th century, many mathematicians would have said that 1 was prime, but now that is changing. In fact, the definition of a prime number now says that a prime number is an integer greater than one that can only be evenly divided by 1 and itself. One reason is that it does not have two positive divisors. Nope! It’s not prime either. If you go back to the actual definition of prime numbers, you have to remember that the integer has to be greater than one. Well, that leaves out zero…so zero is not prime. The definition of a composite number also goes a little further than just having factors other than one and itself. A composite number is a product of prime numbers. Since a prime factorization of zero is not possible…zero is neither prime or composite. 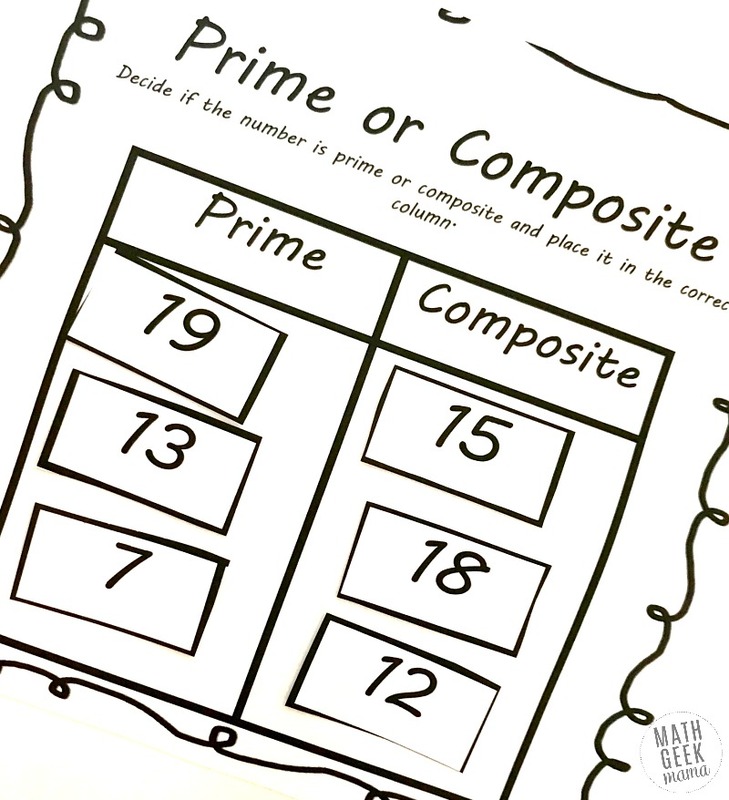 Though we may or may not go into that much detail with our students, it is important for them to play around with prime and composite numbers, and this prime and composite numbers worksheet packet allows them to do so. 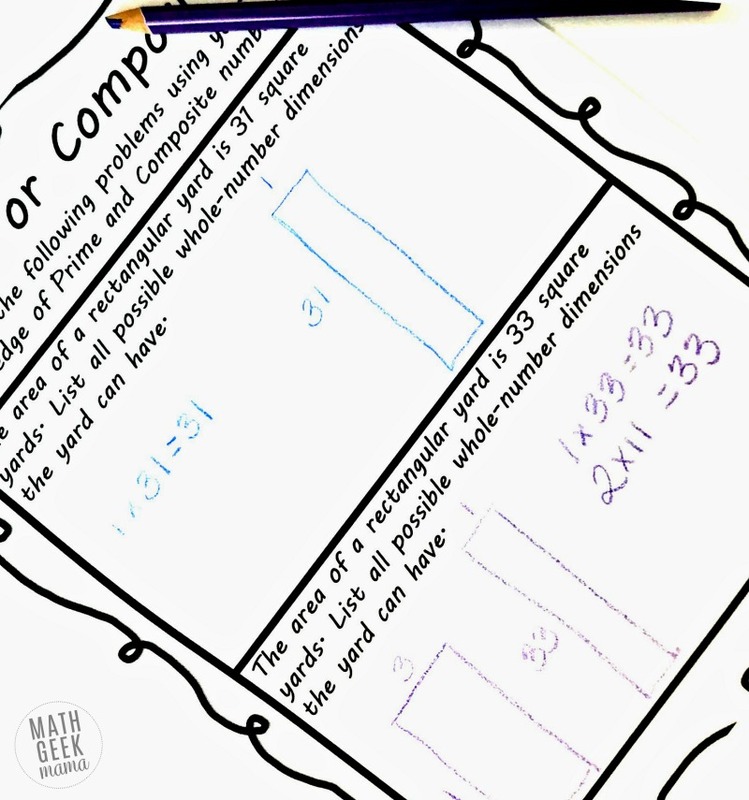 There are 5 interactive worksheets to make sense or prime and composite numbers. 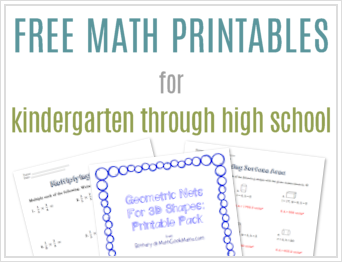 The first three pages of the packet are a simple cut and paste activities. 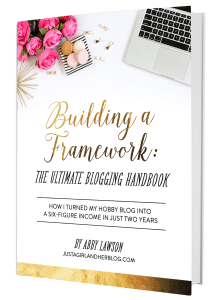 The numbers start off small and increase in value through each page. 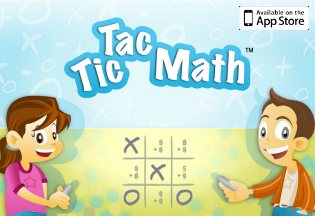 To complete, kids first, cut out the numbers at the bottom of the page. 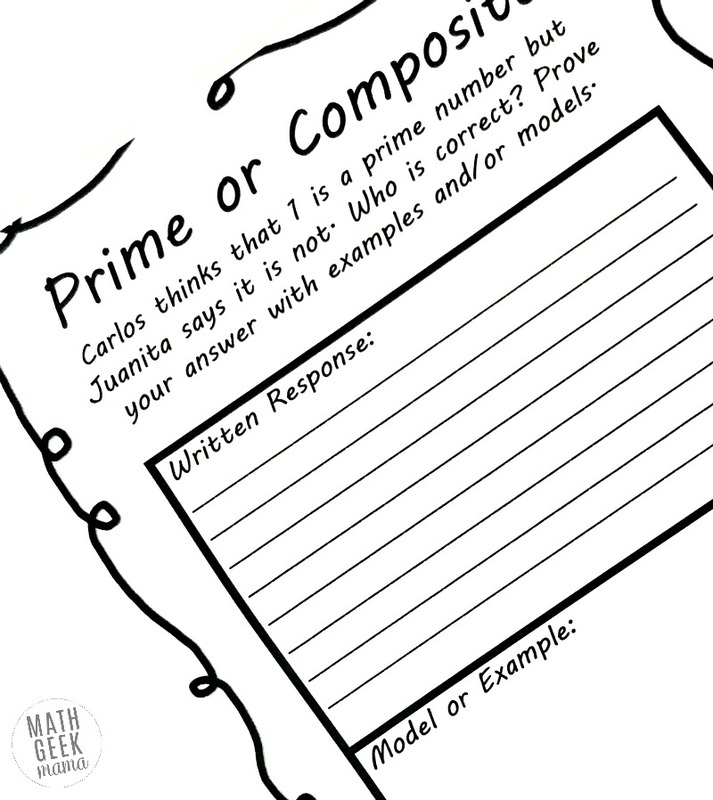 Next, they decide if the numbers are prime or composite. Finally, they glue the numbers under the correct column. The next practice sheet challenges kids to look at the number one, and decide if it’s prime or not. There is a place for them to explain their thinking in words, and then to show their thinking. The last practice page has the children solving an area problem using their knowledge of prime and composite numbers. Once again their is space for the children to draw and model their thinking instead of just writing down the answer. Enjoy exploring these fun numbers!! Thanks for sharing this worksheet! Cutting out and sticking down always works well! I’d not heard the term composite before reading this, I’ve always used the term ‘non-prime’!